The 2015 Chevrolet Malibu and the 2015 Nissan Altima are two of the best options for anyone shopping the family sedan segment. Both models are engineered with safety, performance, and comfort in mind. If you're finding it tough to decide between the two, our four-category comparison will help you get on the right track. Both sedans come with a luxurious amount of passenger space, but the 2015 Chevy Malibu caught our eye with its unusually upscale cabin. Inside, both driver and passengers can comfortably stretch out on the Malibu's well-shaped seat cushions. The dash features a logical layout that's easy to use, minimizing driver distraction. In back, drivers can fill some 16.3 cubic feet of cargo space with heavy-duty shopping hauls or athletic equipment. The 2015 Nissan Altima has a few interior perks of its own, including its NASA-inspired zero gravity front seats, which lend plenty of support on long commutes. Overall, the Altima's cabin is simple yet refined. The backseat offers enough space for average-sized adults to spread out comfortably. The 2015 Chevrolet Malibu has the edge when it comes to performance. Drivers can choose between a fuel-efficient four-cylinder and an impressively powerful V6 engine. The base 2.5-liter four-cylinder is powerful as well, with an output of 196 horsepower and 191 pound-feet of torque. On the road, it achieves 25 city/36 highway mpg. When the Malibu is stopped in traffic, its smooth-shifting start-stop technology turns the engine off to maximize fuel economy. Those Malibu 3LT and 2LZ drivers who prefer a little more highway oomph can choose the 2.0-liter V6 engine. It makes 259 horses and 295 pound-feet of torque. Even with all this power, drivers can expect a respectable 21 city/30 highway mpg. 2015 Nissan Altima trim models come with one of two engines. The 2.5-liter four-cylinder produces 182 horses and 180 pound-feet of torque - slightly less power than drivers see with the base Malibu engine. It achieves 27 city/38 highway mpg. The Altima's upgrade engine is a 3.5-liter V6 that makes 270 horses and 251 pound-feet of torque. Drivers can expect 22/32 mpg. 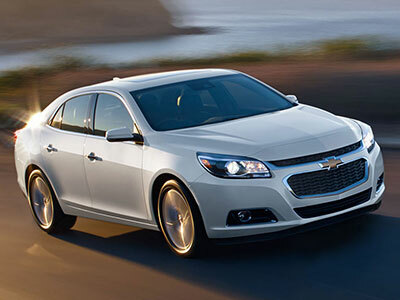 When it comes to top-notch safety standards, drivers can't go wrong with the 2015 Chevy Malibu. In government crash tests, it came away with a perfect five-star score for overall protection. The Insurance Institute for Highway Safety awarded the Malibu with its top score of "Good" after a number of crash tests. Drivers will love the Malibu's high-tech safety equipment. The standard OnStar telematics system lends a hand in problematic situations with its crash notification, roadside assistance, and remote door unlocking technology. An available rearview camera enhances safety in reverse-driving situations. The 2015 Nissan Altima is close behind with a five-star government crash test rating of its own. Its rearview camera is optional for the 2.5 S model and standard for upper trim models. Both the Altima and Malibu maximize safety with standard equipment like antilock brakes and stability and traction control. Both models are heavy contenders when it comes to features. With the 2015 Chevrolet Malibu, however, even the entry-level LS model is packed with creature comforts and high-tech infotainment options. New for 2015 is a standard 4G LTE Wi-Fi connection, allowing passengers to stay connected on the go. Bluetooth phone connectivity means drivers can make hands-free calls. Some feature highlights from the midgrade Malibu models include Chevrolet's MyLink infotainment technology, accessible via a 7-inch touchscreen, and a voice command system. The luxurious LTZ enhances comfort with plush leather seating and a sunroof. The base 2015 Nissan Altima supplies all the basics, including full power accessories and Bluetooth technology. As shoppers move up through the trim models, they can expect more and more comfort and convenience features, including heated front seats and a 7-inch touchscreen with the NissanConnect apps system. The latter supports various smartphone apps, maximizing infotainment options. Although it was a close race in many respects, the 2015 Chevrolet Malibu is the clear winner. Its safety standards are a homerun, offering high-tech safety systems to maximize driver vigilance. Inside, endless infotainment options can keep driver and passenger occupied on even the longest of trips. Seating is spacious and supportive - perfect for families who travel often. On the road, the Malibu is swift, smooth, and powerful.